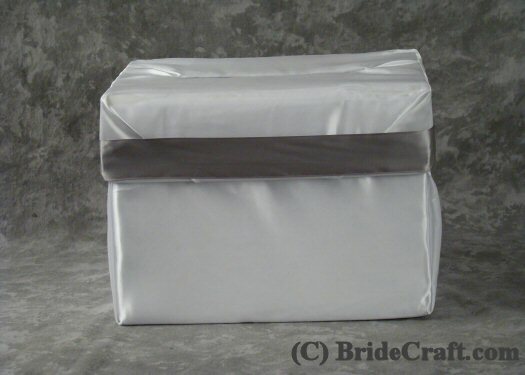 Craft a Satin Card Box for your wedding! 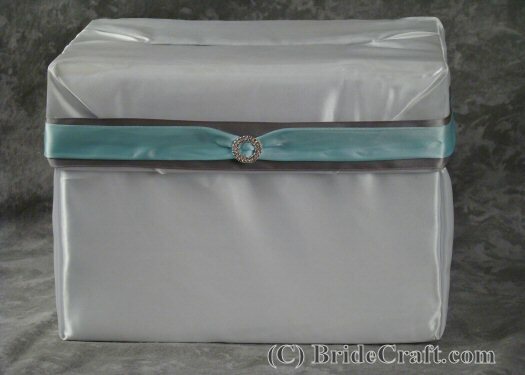 Craft Your Own Satin Card Box! Need a card box? 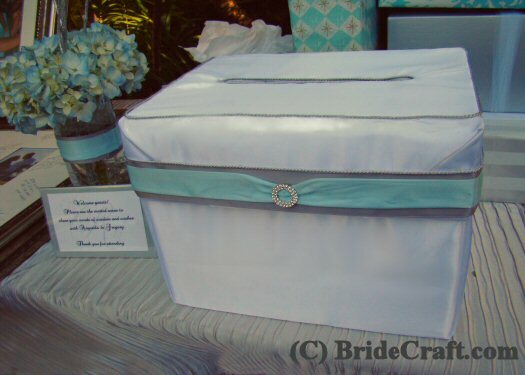 Love how a satin card box looks? Don’t love the high price of the store bought ones? Then this project is for you! 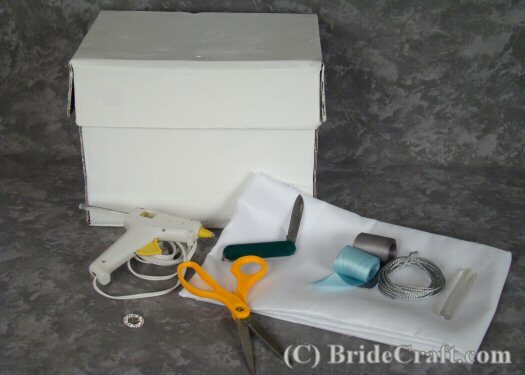 Below you will find a step by step tutorial showing you how to create a satin card box that’s just your style. Pros: Cheap AND easy! This takes no more skill then wrapping a Christmas gift. This can be made in any color, with any embellishments, etc. And it can be made months in advance. Cons: Almost no cons, in my opinion. Be careful when using hot glue not to singe yourself. 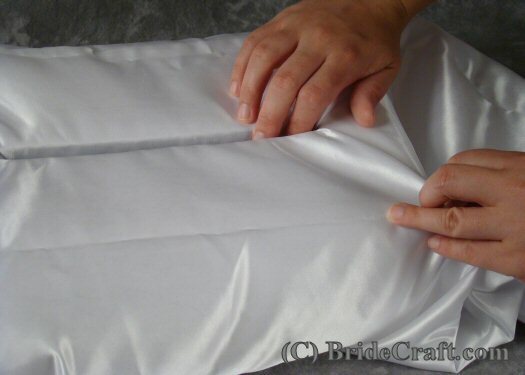 And be careful to buy supplies that are reasonably priced. Step 1: You will need one medium to small box (we used a box that held 5 reams of copy paper), 1 to 2 yards of inexpensive satin fabric, a ruler (not pictured), a glue gun and glue sticks, scissors, a knife or razor cutting blade, a selection of wide ribbons, a buckle or some other embellishment and 1 to 2 yards of decorative cord. Step 2: Using a ruler, measure a long thin rectangle onto the lid of the box. Make sure it is slightly larger than your average card. When you are satisfied with the size and shape, carefully cut the slit into the top of the box with the razor cutter. Step 3: You should have something like this. Step 4: Position a length of material over the box lid, and tuck a small amount into the opening. Step 5: Trim the material to fit the box lid. Cut a slit into the fabric that was tucked into the pre-cut opening of the lid. Begin securing the material to the box with hot glue, as shown above. 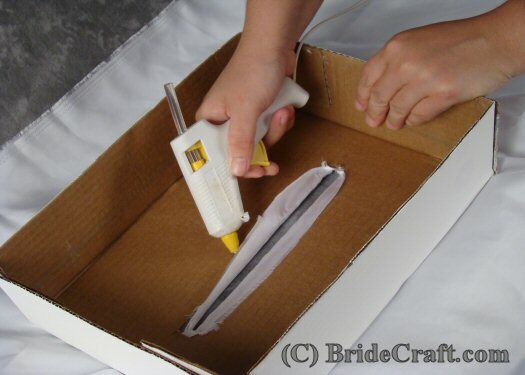 Wrap the box lid just as you would a gift package, and secure with hot glue. 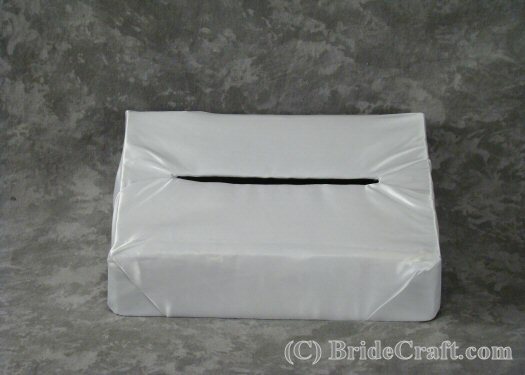 Step 6: You’re satin card box lid should look something like this. Step 7: Use the remainder of the material to wrap the bottom of the box. Again, wrap as if it were a gift package. Secure with hot glue. 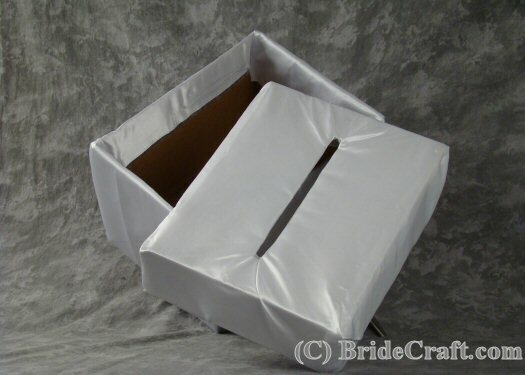 Step 8: The lid and bottom of your satin card box should look like this! Step 9: Begin using your ribbon you enhance the card box. 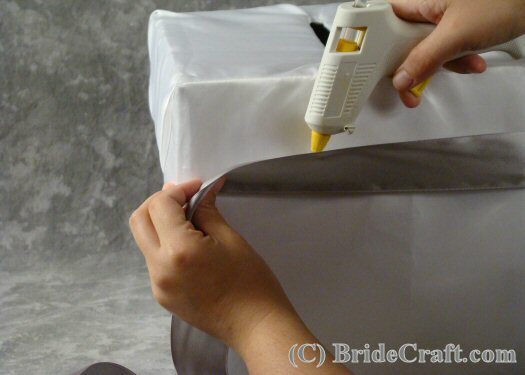 Beginning on a corner, gently dag hot glue onto the box and quickly and firmly press the ribbon onto the lid. 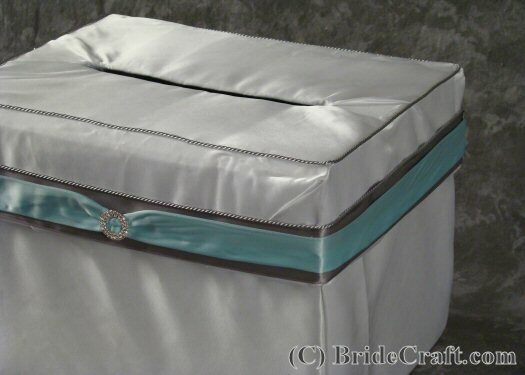 Tip: We chose to keep embellishments on the lid…you can do whatever you like! Step 10: Your lid might look something like this. 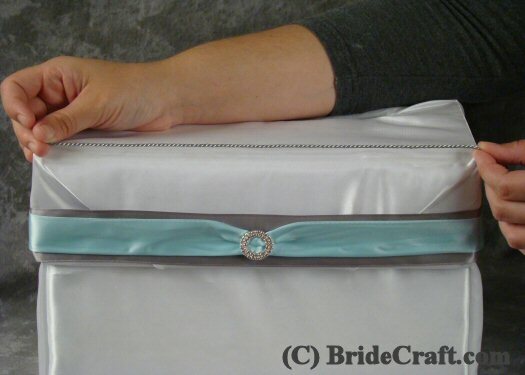 Step 11: Above we have prepared the second length of ribbon by securing a rhinestone buckle onto the ribbon. 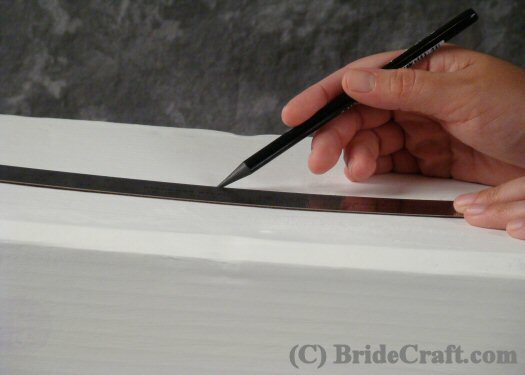 In the same manner as before, glue the ribbon onto the first layer of ribbon on the box. Mind the line up of where the buckle (or chosen embellishment) falls. 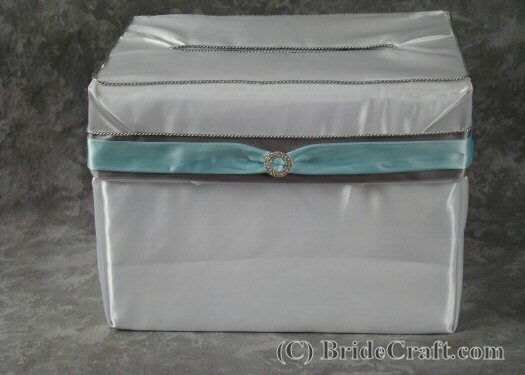 Step 12: Your satin card box is almost complete, and should look something like this. 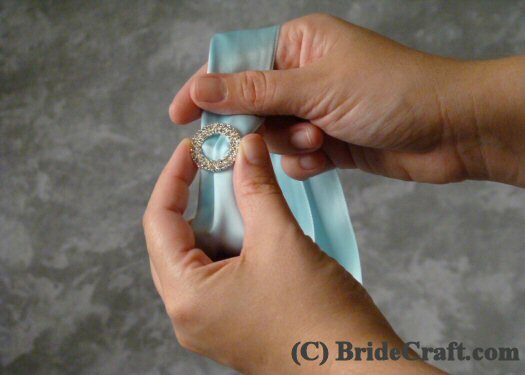 Step 13: Take your decorative cording and measure it against the box lid to determine the best placement. Proceed to hot glue the cord to the box lid in select placed. Tip: The cording does really well around the edges, helping to create a more polished look. Step 14: Do not forget to finish off any crucial elements. It is the details that make the difference. 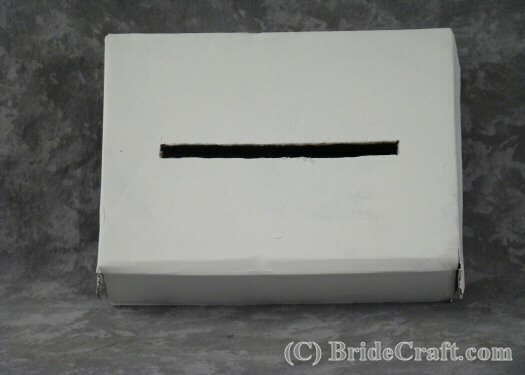 Use the last of the cord to dress the actual card slot on the lid of the box, as seen below. Step 15: Your satin card box is finally complete! 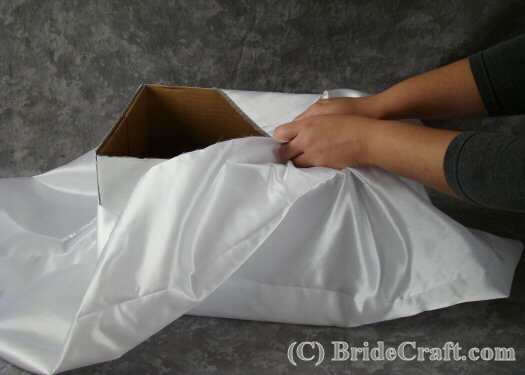 Store in a clean dry place away from moisture until wedding day. Enjoy!